Travelling to the Isle of Wight, the best we could do was to stop off at McDonald’s outside Portsmouth for a bag of chips. Waiting to board the ferry at Portsmouth, I was able to nip out of the car and buy two teas with soya milk from Costa Coffee, but food-wise there was nothing wheat, gluten or dairy free. Luckily as we were going to self catering accommodation, we had a supply of Eat Natural bars and rice cakes to keep us going. We are staying at the West Bay Club, Yarmouth http://www.westbayclub.co.uk/ , an idyllic complex of self catering cottages with a Country Club, equipped with a swimming pool, beauty salon, restaurant, gym and exercise studios. For the more energetic, there are tennis courts and even somewhere to play football! Starving hungry on a Friday night, we checked out the restaurant to find the only items on the menu were rump steak and Bearnaise sauce and beef stroganoff. 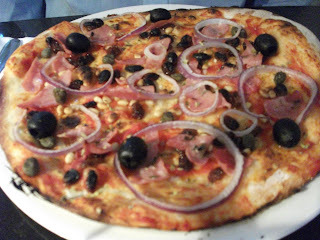 So not fancying a plain steak, we ventured forth to Newport where we tried Olivo, but they were fully booked, so we ended up in Pizza Express, Providence Corner, Pyle Street, Newport http://www.piazzaexpress.com/. Ray checked there was no milk in the pizza dough and was assured there wasn’t. As he says, Pizza Express, is pretty consistent and we can both eat there. For gluten and wheat free customers, there is a good selection of salads such as Nicoise Salad (£9.15). Ray’s dairy free pizza was a Veneziana, but instead of mozzarella, he asked for prosciutto and had red onions, capers, sultanas and pine kernels on the top. What’s more, 25p goes to the Veneziana Fund. Ray asked for a small amount of passata. For him, passata is less likely to cause a reaction as fresh tomatoes, probably because there are no pips in it. We discovered the PizzaXpress iPhone app being advertised which you can use to find a restaurant, book your table and pay your bill with Paypal. Sounds a great scheme. Ray asked for some olive oil: “A sprinkle of olive oil on the pizza makes all the difference because it replaces the fat you would’ve had from mozzarella,” he said. I enjoyed my Nicoise salad; sadly Pizza Express don’t offer gluten free pizzas as yet. Why not, I wonder when Carluccio’s can serve gluten free pasta and sell it in their shop? At Yarmouth, we stopped off at The Gossip’s Café at the end of the square – the only waterside café. Nothing dairy or gluten free here, but enjoyed a cup of tea (with our own soya milk) admiring the views of the Solent and watching the Yarmouth/Lymington ferry boats. It has an unusual wooden pier you can stroll down for more sea views. Monday was the wrong day to visit Ventnor as many of the shops were shut. We had been recommended to visit as it’s an old fashioned place, like stepping back in time to the 1950s, with its independent, quirky shops dominating the high street. We found The Ventnorian, 5 Spring Hill, Ventnor, PO33 1PE, a traditional toy shop selling gluten free and dairy free products at the back of the shop – not many, but good to know about. Some highly individualistic teddies on sale as well. Our visit to Osborne House, East Cowes www.english-heritage.org.uk/osbornehouse wouldn’t have been complete without a cup of tea. Fortunately we’d brought our own soya milk, but I was able to enjoy a gluten free macaroon – delicious. As there was a cream filling, Ray was unable to eat any, so nothing available for dairy free folk. This grand residence was once the seaside retreat of Queen Victoria. Well worth a visit to see how they used to live back then. Very opulent and well maintained. Queen Victoria’s bedroom has been kept exactly as it was following her death. Take a stroll in the beautiful walled garden. 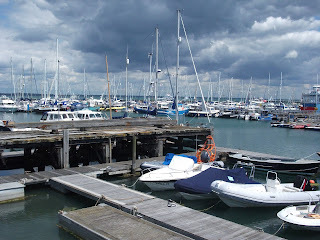 Wandering through Cowes, we chanced upon the British Legion Club, which welcomes visitors. Despite the 1950s décor, it boasts fabulous views of the Solent and boats. We had a cup of tea (90p each) using our own soya milk. The food looked good value – gammon, ham, eggs, chips and peas £5.25 or a jacket potato with tuna mayonnaise £4.95. 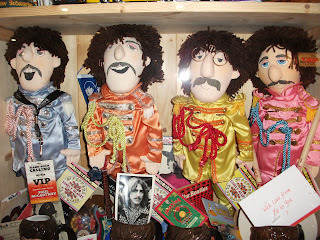 Cowes’ best kept secret is The Octopus Garden, which is a shrine to The Beatles. All the walls are decorated with Beatles posters, photographs and LP covers. There’s a cabinet with incredible lookalike puppets of The Beatles dressed as Sgt Pepper and of course, Beatles’ music plays all the time. The café has a 1960s feel about it to be sure. Most importantly we could both eat there and chose Chris’ breakfast (named after the owner) with a couple of adjustments, at £4.25 each. Ray ordered Isle of Wight sausage, bacon, egg, slices of toast, but no tomato. He asked whether the sausage had milk in it and the owner said he couldn’t be 100% certain, so Ray took a chance. I had the same but with no sausage or toast. Fortunately they told us that the toast was spread with “I Can’t Believe It’s Not Butter” so he asked for strawberry jam instead. The menu gives details under the heading “our guarantee” of where ingredients come from. For example, the sausages, gammon ham and bacon comes from Hamilton’s Butchers, Cowes, while Hovis or Kingsmill bread is used for toast. It said Heinz Baked Beans were served, important for Ray to know as they don’t contain milk (like some other makes). We had deliberately chosen self catering accommodation, so mostly we prepared our own meals, which was a relief because we knew what the contents were. Staples we’d brought with us included soya milk, rice cakes, Eat Natural bars and Marigold’s bouillon, which can be used in so many ways. We discovered the large Sainsbury’s superstore near Newport which has an extensive “free from” section so was able to buy Genius gluten free bread, as well as gluten free pasta (heaven). One tip I’ve been told is to cook gluten free pasta for at least 20 minutes rather than the ten minutes suggested on some packs – it works! There’s also Morrisons in Newport, but it has a tiny ‘free from’ section. Walking into Yarmouth for lunch, we chose Jireh House Yarmouth http://www.jireh-house.com/, where the owner Jan was very welcoming and accommodating. Sitting in the back garden, after having explained his allergies, Ray asked for a smoked salmon sandwich (£3.90) without butter (crucially), lemon, tomatoes or cucumber. When he asked her about milk in the bread, she brought the Hovis packaging for him to look at, so we were able to verify there was no milk in it. I opted for a smoked salmon salad (£10.95). We noticed there was a sign warning people about “Falling Apples” from the impressively large apple tree. She asked me to send her recipes, as she likes to serve gluten free cakes, so I will do so. At the Deli in Yarmouth (just along the road from Jireh House), we saw several gluten free products on sale such as Hale & Hearty gluten free porridge and Mrs Crimbles’ gluten free cakes, but they don’t sell soya milk. We found that in nearby Cost Cutters. For a treat on our last night, we visited Olivo Bar & Caffeteria in Newport, 15 St Thomas Square, PO30 1SL, tel: 01983 530001. This restaurant is always busy, so it’s important to book. Even on a Thursday night, two large parties arrived and they had to turn away a party of 14. When I made the reservation, I mentioned the food allergies Ray and I had and was impressed that they had made a note of this. To start with, we ordered Pincho (£4.50) – hummus, chorizo, olives and flat bread. They checked to see if there was no milk in the flatbread, but couldn’t be 100% certain, so Ray took a chance. Being gluten free, I didn’t have any bread. At their own volition, they checked the chorizo sausage ingredients, discovered there was milk powder and came and told us. This is the first time that any restaurant has gone to such trouble to check the ingredients of a sausage. They put the chorizo sausage in a separate bowl and gave it to me, so Ray wouldn’t be tempted. 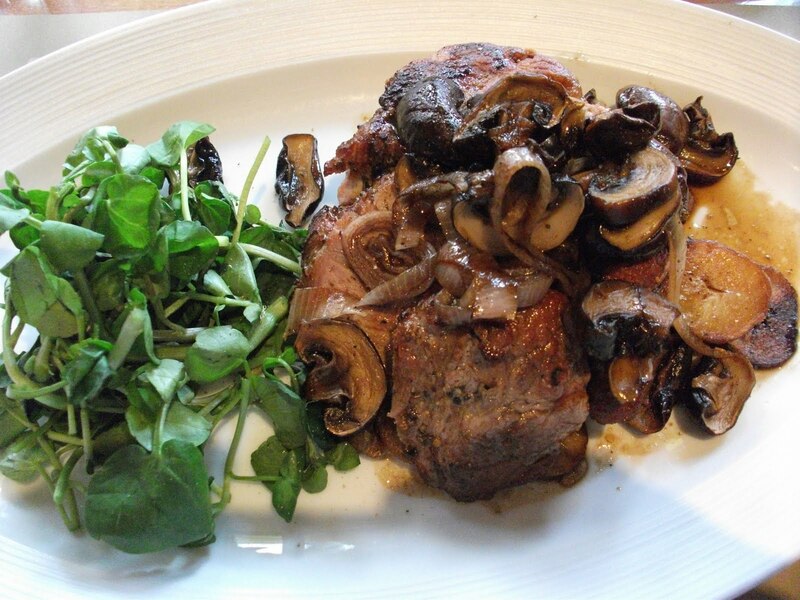 For the main course, Ray asked if he could have Spalla di Maiale (£14.50) – pan fried pork spare rib steak with shallots and chestnut mushrooms and new potatoes. The staff checked with the kitchen and they said they would give him a different garnish, with no butter. I enjoyed sea bass with sauté potatoes and tsikali. (£14.95). Both were delicious and well presented. Top marks Olivo!